This Easter hymn pictures Christ's death as the final battle with the powers of evil, but Christ is the victor; his resurrection marks the decisive outcome of that battle. Each stanza begins with some aspect of Christ's resurrection and moves to our response of praise. A poetic commentary on and summary of Paul's resurrection discourse in 1 Corinthians 15, the entire text is framed with "alleluias" (like some of the psalms). Although John M. Neale (PHH 342) believed this text came from the twelfth century, no medieval manuscript containing the text has been found. Based on a Latin hymn ("Finita iam sunt proelia"), “The Strife Is O'er” first appeared in the Jesuit collection Symphonia Sirenum Selectarum in 1695. Francis Pott (b. Southwark, Surrey, England, 1832; d. Speldhurst, Kent, England, 1909) translated the text around 1859. The text was published in five stanzas in two 1861 hymnals: Pott's Hymns Fitted to the Order of Common Prayer and Hymns Ancient and Modern (with a few changes). Educated at Brasenose College, Oxford, England, Pott was ordained in the Church of England in 1856. However, his severe hearing loss caused his retirement from a pastorate at Norhill in Ely (1866-1891). A member of the committee that produced Hymns Ancient and Modern (1861), Pott also published original hymns, translations from Latin, and Syriac hymns in Hymns Fitted to the Order of Common Prayer (1861). During his retirement he devoted himself to improvements in worship and singing, and he edited The Free Rhythm Psalter (1898). The origin of this tune lies in a choral mass by the great Italian Renaissance composer Giovanni Pierluigi da Palestrina (b. Palestrina, Italy, c. 1525; d. Rome, Italy, 1594). One of the most gifted composers of his age, Palestrina influenced church music for many centuries. He began his musical training at the age of nine when he went to Rome to become a chorister in the Church of Santa Maria Maggiori. By 1544 he was a singing teacher and organist at the cathedral in his hometown of Palestrina and had begun composing. In 1551 the bishop of Palestrina became Pope Julius III, and he took the musician with him to Rome. Palestrina lived in Rome until his death. As his fame as choirmaster and composer grew, he held a series of increasingly prestigious positions–teacher at the Jesuit seminary from 1565 to 1571 and choirmaster at the Capella Giulia at St. Peter's from 1571 to 1594. His first decade in Rome was difficult: during that time he lost two sons and two brothers to epidemics, and in 1580 his wife died. Although Palestrina had begun preparation to enter the priesthood in 1581, he instead married the rich widow of a fur and leather merchant and then helped to conduct her business. A prolific composer, mainly of church music, he wrote one hundred masses and four hundred motets. For many years after the Council of Trent, Palestrina was considered the model composer for Roman Catholic liturgical music. William H. Monk (PHH 332) adapted the first phrases of the Gloria Patri in Palestrina's Magnificat Tertii Toni (1591) to create VICTORY. Monk added his own "alleluia" at the close of the text. 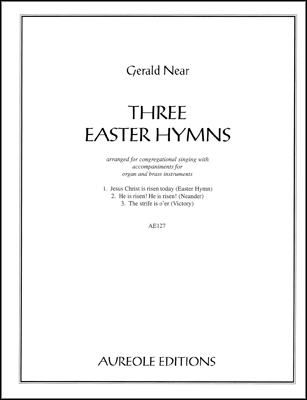 His arrangement was published in Hymns Ancient and Modern (1861). 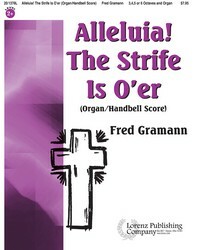 Also known as PALESTRINA, the tune is rather sober but surrounded by festive "alleluias." The first three "alleluias" should be sung once at the beginning and once at the conclusion of the hymn; each stanza ends with its own "alleluia." 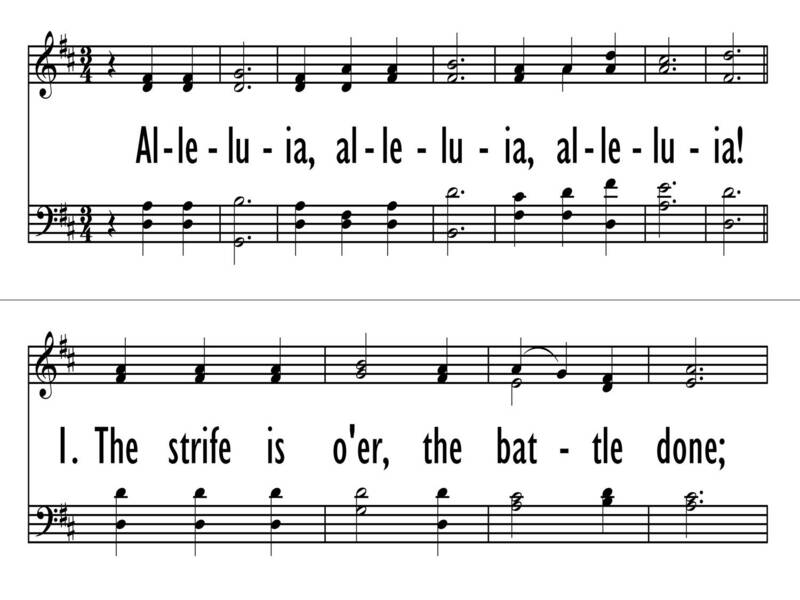 Have everyone sing the "alleluias" in unison, but assign stanzas to antiphonal groups. Organists need to observe the rest in the final line of the stanza (just before the single closing "alleluia") with much care. This hymn is a good candidate for a brass ensemble, especially on the "alleluias." GELOBT SEI GOTT (397) is a good alternate tune–it does not include the initial “alleluias” but does place three "alleluias" at the end of each stanza.